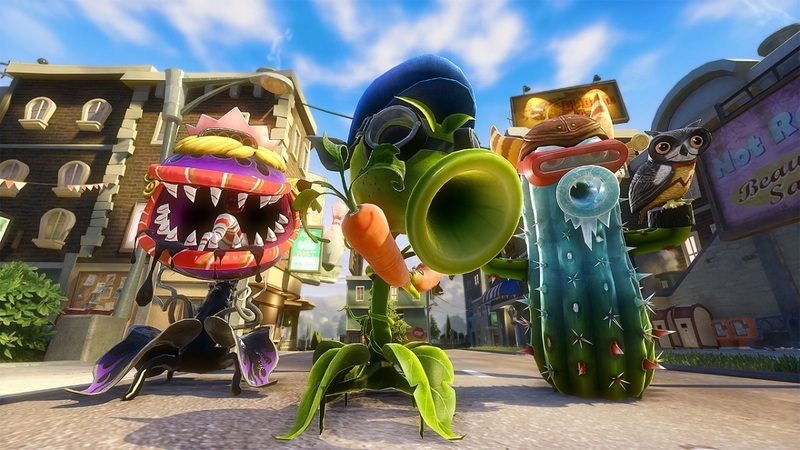 Plants vs Zombies: Garden Warfare 2 is a refined execution of its predecessor. The same multiplayer and co-op modes have returned (with a few welcome additions), the roster of characters for both sides have expanded (as well as the customization options), and the main menu has been replaced with an interactive “Backyard Battleground” area. It is, for better and worse, more of the original. Having more of something can be a good thing. For instance, having more activities in which players can participate. This is encapsulated within the Backyard Battleground. It is, in essence, Garden Warfare 2’s interactive lobby area. Players can explore a (limited) open world where there are secrets to discover and an ever raging war between the two eponymous sides. You are free to test out new character class builds against A.I. enemies, invite friends into the area to join you, setup a multiplayer or co-op match using the appropriate console, or partake in the new single-player quests. There’s even a flagpole in the middle of the “neutral zone” that kicks off an endless horde mode if you just want to shoot a bunch of stuff and earn some coins. It is your playground and your in-game menus all rolled into one, and it is fantastic. I cannot think of another shooter that has provided me with a place where I can hangout with friends and engage with the game on a more casual level when I need a break from the action. It is something I would like to see in other games. Just as in the original you’ll earn coins by participating in the multiplayer and co-op modes, which in turn are used to purchase card/sticker packs. These packs usually contain consumable items, such as plants, weeds, bots, or zombies, that are used in the multiplayer and co-op modes to boost your defenses or aid in your assault, as well as character customization items, like new hats. The more expensive packs will also contain character stickers, which unlock variants of the character classes, and possibly new character abilities. These character variants use the same abilities as the basic version, but have different main attacks. For example, the fire-based Peashooter still has the Chili Bean Bomb, Pea Gatling, and Hyper abilities, but it shoots peas that set enemies on fire. Across the game’s 14 different classes, there are over 100 unlockable variants, and this is where the negative side to all of Garden Warfare 2’s “more” fits in. One of the conventions of the modern multiplayer shooter environment is leveling your multiplayer avatar to unlock new gear, abilities, and/or customization options. Garden Warfare implemented this idea, to some degree, through the “Rank System.” Players would rank up entire character classes by completing certain challenges, which in turn would unlock new upgrades for that class. Garden Warfare 2 has scrapped that almost all together (the challenges have been moved to the quest/bounty board) in favor of a straightforward experience system. 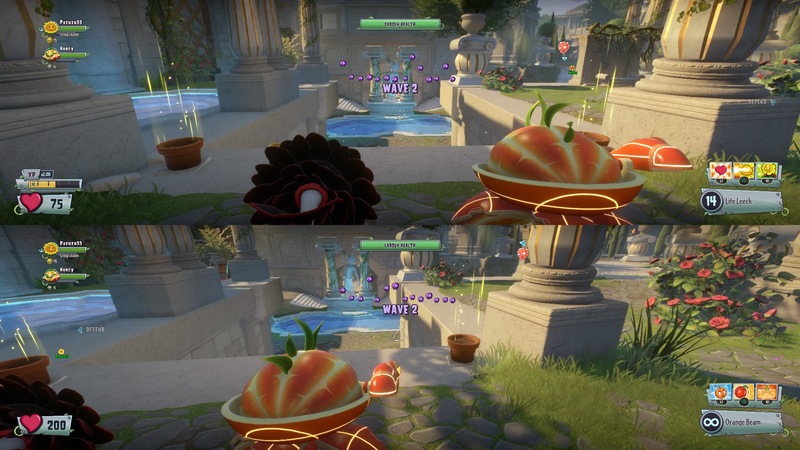 Your character will earn experience through almost every action they take, whether it’s vanquishing foes, healing allies, capturing strategic points in a multiplayer match, or completing a wave in Garden Ops. At levels five and nine your character earns a new character upgrade, like being able to regenerate health faster or doing more damage. Once they reach level 10 you can promote them, which resets their level back to one, gives them a new title (specialist, advanced, elite, super elite), and gifts you 20,000 coins. This process can be repeated five times for each character, which is the catch. Page created in 0.7880 seconds.